Get your bike ready for the summer at these monthly bike workshops in the Queen's Park north car park. First Saturday of the month April to October. 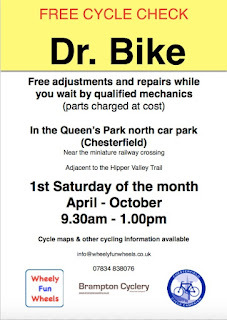 Mechanics from Wheely Fun Wheels and Brampton Cyclery on hand to do free checks and adjustments, any parts used charged at cost. 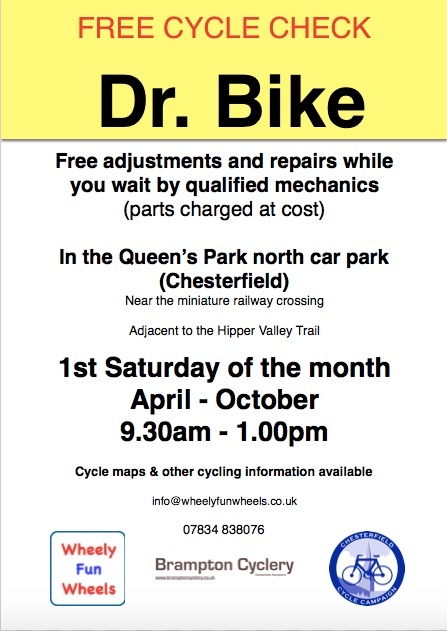 Cycle maps and other info available too from Chesterfield Cycle Campaign. The last of our winter family rides will be on Saturday 11th March. Leaving from the Queen's Park north car park at 11.00am we will probably cycle to Holmebrook Valley Park and back dependant on weather. We expect normal club sessions to resume after Easter. Thursday evenings at Old Hall Primary School.